LONDON--(BUSINESS WIRE)--According to the latest market research report released by Technavio, the global gin market is expected to accelerate at a CAGR of over 3% during the forecast period. The expansion of organized retailing is one of the key factors triggering the growth of the market. This research report titled ‘Global Gin Market 2018-2022’ provides an in-depth analysis of the market in terms of revenue and emerging market trends. It also includes an up-to-date analysis and forecasts for various market segments and all geographical regions. In 2017, the standard segment accounted for 40.41% of the global market and is projected to reach 40.67% by 2022, exhibiting 0.26% increase in market share. The rising influence of online retailing is an emerging trend in the global gin market. Customers today prefer online shopping and pay for their orders using credit or debit cards, which helps them in avoiding time-consuming journeys and billing queues. The online shopping portals have also incorporated enhanced security features along with customer-friendly website designs that offer efficient customer service, secure payment options, and enhanced product visibility. This trend is encouraging various manufacturers to concentrate on the internet-savvy customer segment and explore the new online retail format. This mode of business will help vendors in saving the operating costs and overheads, which are comparatively lower in the online retail format in comparison to the physical store format. 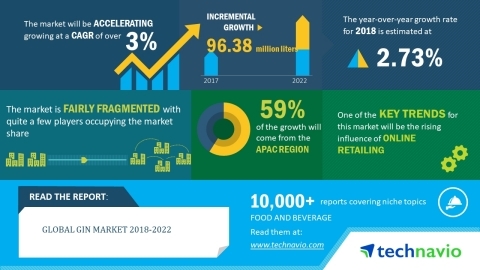 According to the latest market research report released by Technavio, the global gin market is expected to accelerate at a CAGR of over 3% until 2022.